Their desings were a little complicated, and the colors uuuughhh the colors!!! well I like the 3 fusions but I'm mixed ij opinon on the 3 way fusion. I would say the mIddle one needs work basicly. perhaps draw an Alternate concept of how this one fusion charecter weould look? 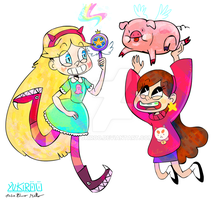 Too bad they would never crossover officially, I would love to see them meet in an actual episode now And my personal favorite is Steven & Star. Star Steven? Steven Star? Steven Butterfly?? Star Universe??? But the intermediary designs look awesome! ...WHAT KIND OF ABOMINATION IS THIS!?!? Cartoon Logic make's NOOOOOO SEEEEEENSE! Steven-Mabel is my favorite of the bunch as well. You made their designs work really well together the best out of all of them. grea work! its so original, and i love how you did the clothes mixing thing, its so perfect!